Work to create a temporary footbridge to cross the tracks at Sleaford railway station is all but complete. After four days of work, Network Rail contractors have assembled a scaffold bridge spanning the station at the opposite end of the platforms to the existing bridge which is due to undergo major refurbishment over the next ten weeks. 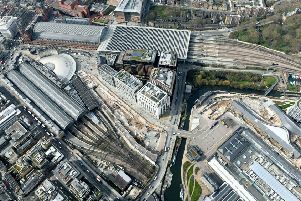 Network Rail has announced it will be carrying out essential improvement work to the footbridge meaning it will be out of use for the duration of the work. Planned works include steel strengthening and painting of the existing bridge. Work will go on between 7.30am-5pm and 10.30pm-6am Monday to Friday and 11.30pm to 9am Saturday and Sunday. Denise Thompson, Community Relations manager explained in her letter to neighbours: “We understand that working overnight is far from ideal, but we are obliged to work on the railway at times that cause least disruption to trains. Unfortunately this means carrying out a lot of our work at weekends or overnight.